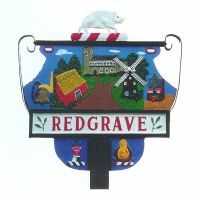 The village of Redgrave is situated on the Norfolk/Suffolk border, 6 miles from Diss, 1 mile from the A143 and at the source of the river Waveney and the Little Ouse. It is an historic picture postcard village with an active community and many activities. Redgrave, along with its neighbouring communities in Botesdale and Rickinghall, is twinned with the town of Tinteniac in France. There are approximately 220 homes in the village, 50 of which are listed and many are thatched. The centre of the village is marked by “The Knoll”, an attractive village green with an historic oak tree and a pond which provides a home to wild ducks and other wildlife. The village green is surrounded by a number of attractive buildings, including the quaint beamed local pub, the Crosskeys. Also in the centre of the village is the only remaining shop. After all shops in the village closed in 2007, a number of the local villagers grasped the opportunity to open a Community Shop in part of the original Post Office premises with the help of grants, loans and local support. This small shop is now open 7 days a week, thanks to the continuing efforts of more than 30 villagers, and to the delight of the many residents who are able to shop for their papers and provisions daily and keep in touch with their neighbours. Redgrave is served by 3 churches, the spectacular Grade 1 listed St Mary's on the outskirts of the village, the All Saints church in the centre of the village which was converted from the old Mission Room and the more informal Cafe Church which meets every Sunday in the Amenities Centre. St Mary's was recently taken into the care of the Churches Conservation Trust who, with the local Redgrave Church Heritage Trust, have turned the church into a magnificent venue for plays, concerts, lectures, exhibitions etc, complete with toilets, kitchen, heating and a removable stage. Young and old are supported by village activities with a large children's playground, a teen shelter and many sports and social clubs that operate from the Amenities Centre. A large sports field supports the very successful Redgrave Rangers Football team and Redgrave Cycle and Cyclo-Cross races. For the less active there are clubs and groups for art, needle craft, wood craft, keep fit, whist, gardening, theatre visits, singers, and together with neighbouring Wortham, a theatre society which puts on plays locally and in Redgrave Church. 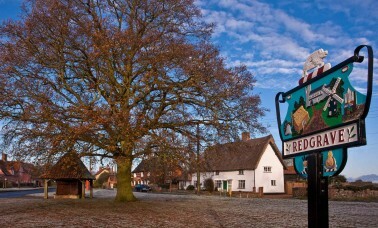 Redgrave village is just down the road from the nationally recognised Redgrave and Lopham Fen, home to the very rare Raft Spider which features on the attractive village sign. The fen is owned by 200 year old land enclosure trusts from the villages of Redgrave and Lopham and is managed by the Suffolk Wildlife Trust. In addition the Parish Council appoints an active trustee of the Little Ouse Headwaters project which is being very successful in opening up the Little Ouse valley for both people and wildlife.